The task of teaching children the skills that will allow them to enjoy a lifetime of optimal oral health begins at home, and if you’re a parent, you know that persistence and repetition can be very beneficial when your children are learning new tasks. Whether they are learning a new subject in school, a new sport, or anything else, practicing the new activity every day is essential to grasping the skill and knowledge needed to form healthy habits. Learning how to properly care for and store their toothbrush is no different, and in today’s blog, we’ll review a few tips that can assist you as they learn a few best practices. At Alligator Dental, we strive to make going to the dentist fun. Our team of pediatric dentists want to do everything we can to help you teach your child healthy oral hygiene practices. If you’re looking for a kid-friendly dentist in Seguin, give us a call today to schedule your child’s appointment! When it comes to taking care of your children’s toothbrushes, it is helpful to involve them in the process so that they can eventually do it properly on their own. Below, we’ve provided a few tips that are important to keep in mind as you teach your child about toothbrush care. This might seem like an obvious tip, however, when children are learning the importance of sharing things with friends and siblings, they may need to be reminded that not everything is appropriate to share. If your child is away from home and forgot his or her toothbrush, it may be tempting to use a friend’s or relative’s, however, doing so exposes both users to bacteria and microorganisms. This can increase the odds of oral infection and illness, and should be avoided. When we brush our teeth, we do so to remove bacteria, food particles, and other debris. Reminding your child to rinse his or her toothbrush out thoroughly after each use is necessary to ensure that these small particles don’t stay on the brush. Additionally, leftover toothpaste can make the bristles on the toothbrush very inflexible, and if care is not take to soften the bristles before the next use, your child could cause harm to his or her sensitive gum tissue. As they learn proper oral hygiene techniques, it is common for many children to apply more pressure than necessary during the brushing process. Brushing too hard can cause several oral health concerns, including gum trauma. In addition to harming the soft tissues in the mouth, too much pressure can cause unnecessary wear and tear on a toothbrush, and a toothbrush with worn, splayed bristles won’t clean as properly as an undamaged one. Having trouble talking to your little one about proper oral hygiene? Alligator Dental is here to help. Schedule your appointment with our team of pediatric dentists in Seguin today! Looking for a Pediatric Dentist in Seguin?Schedule an Appointment Today! Properly storing your child’s toothbrush is essential to ensuring that it cleans effectively and remains free of germs. Check out the tips below and remind your child about them every time he or she brushes. 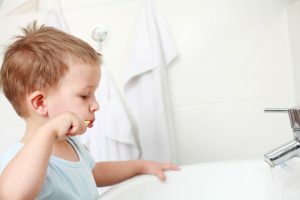 When children are so focused on brushing their teeth, they commonly don’t give much thought to where their toothbrush goes once they are done. Some children may simply leave it in the sink or set it on the counter once finished, which doesn’t allow the brush to dry as it should. When monitoring your child’s brushing habits, it’s helpful to remind him or her to place the toothbrush upright in a toothbrush holder or cup so that the water can drain off properly. There are all kinds of neat toothbrush storage containers on the market today that protect the toothbrush from end to end. While these gadgets are handy for travel and sleepovers, they aren’t something that should be used on a regular basis. Because a covered toothbrush promotes the growth of microbes and bacteria, it is best to remind your child to store his or her toothbrush out in the open. Because they get used twice a day, toothbrushes commonly experience a significant amount of wear after a month or two. The bristles may become bent or frayed, or some may even fall out. Because we know that a worn toothbrush doesn’t clean as effectively as a new one does, we recommend replacing your toothbrush every three months or so. If your child was recently sick or the brush is very worn, it may need to be replaced sooner. Learning a new skill is easier for kids when it’s fun, and properly caring for and storing their toothbrush is no different. 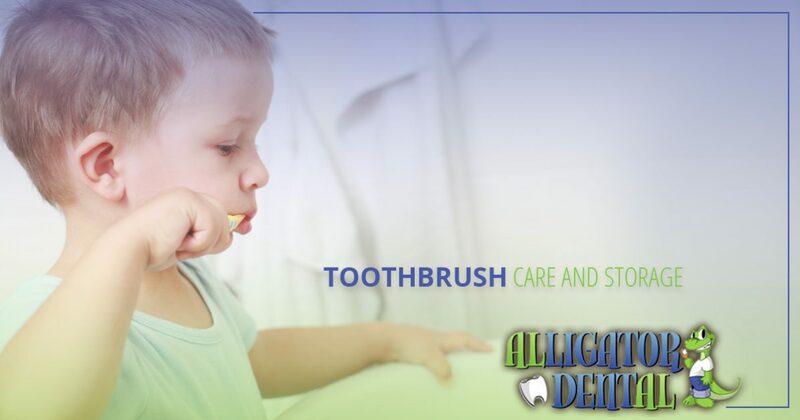 The dentists at Alligator Dental in Seguin are proud to be your go-to source for children’s dentistry and oral hygiene education. Whether your child needs his or her first dental exam or requires emergency pediatric dental care, we are here for you. Contact us at 830-372-3725 today to schedule an appointment with a pediatric dentist!